My name is D.J. Svoboda, an artist diagnosed with Autism. I am the creator of the Imagifriends of Imagiville. The Imagifriends of Imagiville are based on the experiences I have faced during times at school. There were days at school when I was made fun of, and when I was picked on and treated mean. Those made me feel very sad and hurt. That is how I got the idea of the Imagfriends of Imagiville…now I want to share my experiences to help open people’s minds, hearts and souls to have more compassion and awareness for Autism. It has always been my dream since I authored the first book to make this into a full animated series and I need to start somewhere. I’m asking for anyone who’s ever believed in me to believe in Imagiville now more than ever. Above is a Music Video that my friend, Brian Cimins, owner of Grapplers Quest and Life Coach at http://YourStrategyCoach.com helped me create a song and music video. 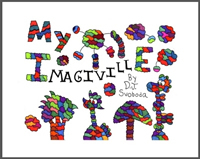 I want to keep creating books, calendars and gifts, but I also want to see Imagiville become a living, breathing cartoon that can inspire millions of children throughout the world. With your support, I will be working together with Brian Cimins to create a teaser episode of The ImagiFriends of Imagiville to pitch to major television networks. Help me dream big!